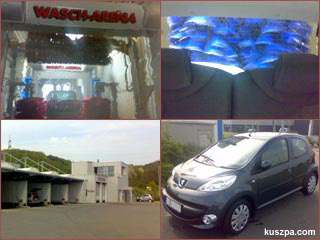 Washing bay, car-wash plant, scrub brushes and a glittering car. i find this story amazing..it´s really funny…you show people here you take the car..and you call it funny names..and you seem to really like this Peugeut. SORRY IF I´M ALWAYS CHECKING WANT YOU WRITE HERE BUT YOU REALLY ARE A VERY FUNNY MAN!! !